310 mm (12.2") Servo Rotary Table with wraparound motor. 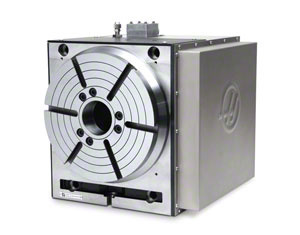 Requires Haas mill with 4th-axis drive for full 4th-axis operation, or a rotary control box for stand-alone operation. Haas Automation is the largest machine tool manufacturer in North America, building a full line of CNC vertical and horizontal machining centers, CNC lathes, rotary tables and 5c indexers. Haas machine tools and rotary products are built to deliver higher accuracy, repeatability and durability than any other machine tools on the market. From its beginnings in 1983, Haas Automation has always produced top-quality products at affordable prices. Haas produces all critical components in-house, using dedicated state-of-the-art cnc machine tools. the company's 1 million-square-foot facility makes extensive use of automated lights-out flexible manufacturing systems (FMS) and robotic loaders to streamline production capabilities and reduce costs. This, combined with highly trained electronics and mechanical assembly teams, allows Haas to control quality, cost, reliability and availability. Haas delivers more standard features, high-tech innovations and rock-solid engineering than perhaps any other CNC manufacturer in the world and at better prices. 114 ModelsView more about Haas Automation, Inc. Looking to Purchase a New HAAS HRT310SP? Looking for a USED HRT310SP?Have one to sell? Timco Machine Tools & Tooling, Inc. Corporation Sigma, S.A. De C.V.
Haas Machine Tools, S.A. de C.V.
D & W Maquinarias C.A. Tai Tong Machinery Co., Ltd. SHINE & HARMONY CO., LTD.
Tongan Park, Tongan Industrial Dist. Longcheng Industrial Park, Chengqinglin South Rd., Longgang Dist. Southern Outer Circle Ring, Huaiyin Dist. Guangrun Mansion, Middle Tongjiang Rd. No.568, East Siming Road, Yinzhou Dist. NO.1 Dan Long Rd, Jing Kai Dist.